My list of must-read business writers continues to expand. Gary Hamel, however, author of What Matters Now, with the very long subtitle of How to Win in a World of Relentless Change, Ferocious Competition, and Unstoppable Innovation, has been on the list for quite some time. 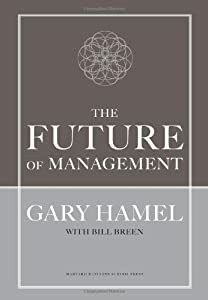 Continuing his thesis on the need for a new approach to management introduced in his prior book The Future of Management, Hamel calls for a complete rethinking of how enterprises are run. Fundamental to his recommendation is that the practice of management is ossified in a command and control system that is now generations old and needs to be replaced with something that reflects an educated workforce, globalized demand and supply, the Internet and networks in general, and the incorporation of technology into everything. Further, he also calls for a new era of ethics in business, lamenting the failure of banks and investment banks to monitor themselves, and being in the center of the causes of the Great Recession. His indictment of business behavior really leads to my only criticism of the book. The first 35 pages are devoted to recounting the recent problems. Since I lived through all that, and watched it, I didn’t need detailed reminders of the questions about Complexity, Leverage, Illiquidity, Deceit, Hubris (all paragraph headers) etc., that were part of the near-collapse of the U.S. economy from far too much debt at every level. He moves to a background review. In summary he believes that enterprises are largely managed with techniques from the turn of the last century, designed when most factory workers were poorly educated, with multiple layers of supervisors, managers, senior managers, etc., etc. with some kind of a standard ratio of one to ten or so, that creates giant management overheads. Those overheads, perhaps once necessary in a mass production era with a less educated workforce and little information technology, in his view, now slow decisions, impede innovation, and restrict senior executives from a real understanding of what is happening at the customer/product level. That’s what he wants to dramatically change. The balance of the book is devoted to approaches and examples of companies on the edge of radically different structures (e.g. W.L. Gore, Morning Star) that are making self-directed teams, smaller business units, and innovation from the bottom, work to create faster, more nimble, more responsive – and profitable businesses. He proposes that leaders think of five areas where an overhaul is needed: Values, Innovation, Adaptability, Passion and Ideology. His argument is that today’s global competition, and pace of change driven by technology combined with a new generation of workers who want something more than just a paycheck, means that to succeed, companies must (a) welcome ideas and innovation coming from every part and level of the enterprise, (b) scrap traditional control systems that really don’t work anyway (e.g. presumably there were plenty of traditional control systems in place that failed to prevent the sub-prime mortgage crisis) while stifling the business, (c) engage employees in such a way that they commit to higher effectiveness, and infuse the organization with values that lead to the right moral and ethical decisions without energy-sapping control systems. It is a good challenge for managers to contemplate. I’ll admit to struggling to see how some of my prior employers could evolve into a Morning Star, with self-directed workers and virtually no managers. But it remains thought-provoking. He concludes with a list of twenty-five “moonshot” ideas, that is, bold big ideas for leaders to consider. While most readers will have seen some of these, they probably have not seen all of them, and certainly not all in one place. I continue to rate Hamel as a must-read for business executives and exec –wannabes. This is no exception. Recommended.